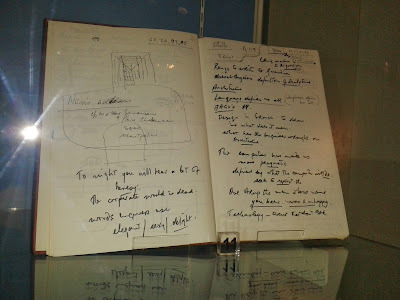 At a recent exhibition, hosted in the Queen's University Belfast Naughton Gallery, I was taken by the inclusion of the notebook pictured below in one of the gallery bookcases. It was one of 47 kept by the engineer Peter Rice (1935-1992). The exhibition, entitled Traces of Peter Rice, included dozens of photographs and models of many of the projects worked on by this gifted and talented creative. I needed to know more and purchased the accompanying book, Traces of Peter Rice, Barry, K. (ed) Lilliput Press, Dublin, 2012. Towards the end of the text J. Philip O'Kane has provided an essay, On first looking into Rice's engineering notebooks. It's a fascinating read that has preserved in my mind's eye an enduring image of a simple, black, A4 notebook. 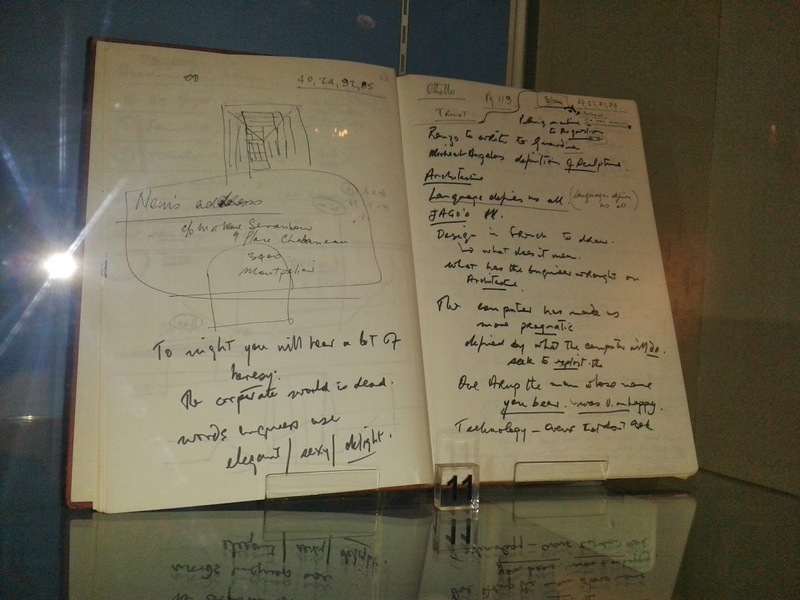 On the pages selected for display there are preparatory notes for a video-recorded lecture given to young architects. See YouTube video here. If these two pages are representative of the remainder - how I would have loved to leaf through it - the notebook is both personal and personable to the point that I can imagine him flicking back through its pages, noting anecdotes, calls to make, ideas. All captured in a style that perhaps was never meant for sharing but as an aide memoire to self, recording the flow of ideas at some productive period or other. Ever since primary school I have loved and kept notebooks. Whether it was a new jotter or exercise book I always took particular care when writing on that pristine first page. I have used many different kinds over the years and for a while favoured small pocket-sized ones. I still have several and reviewing some for this post see that I have notes of meetings, addresses, ideas for various projects and reflections on a nice meal or an event I attended. Most entries are dated but many are not. Several have neat diagonal lines across them showing that action was taken or an idea followed up. For the past 3 years I've been using large, plain, Moleskins. They can seem expensive at over £10 but there is something special about writing on quality paper - each new leaf as pristine as the previous, primary page. They are brilliant for confiding thoughts, ideas and developing strategies. In these busy, wired-up times sometimes what you need is a time-tested simple way of keeping track. 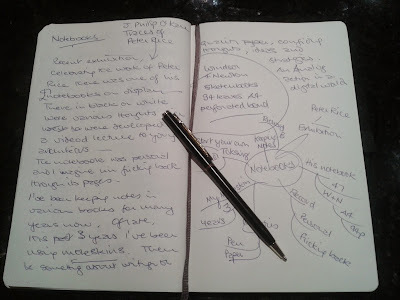 For me, notebooks are my analogue tools for a digital world. Last year I attended Sandi Toksvig's My Valentine show. As a prize for some audience participation, instead of offering her then latest book, Valentine Grey, she gave a Moleskin encouraging the grateful recipient to start writing their own book! And you do have a sense of keeping a personal biography with these high quality, durable products. For me though, the notebook is more of an action device. You cannot be sure when an idea comes so having pen and paper to hand is one sure way of making sure it doesn't disappear into the ether. 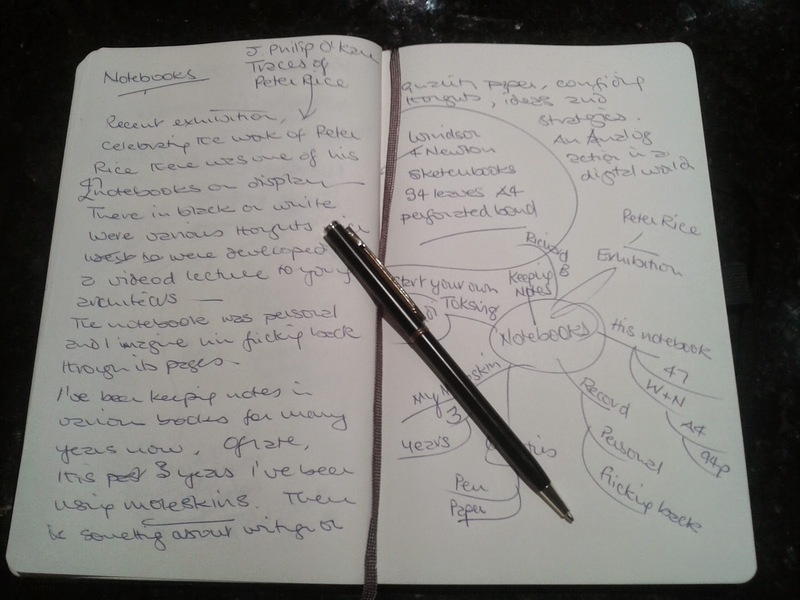 Richard Branson is a big fan of notebooks and encourages us in his blog to always write down ideas. On one occasion the only paper he had to hand was his passport so he used that to record what was on his mind. Was there anything in this post that was worth noting? Do you take notes? And if you do how do you take and keep them? What kind of things would we see recorded in your notebook? Maybe you use electronic devices - is there still a place for pen and paper in your digital world.